A friend who is a keen golfer and ardent follower of the sport reminds me just how successful British and European golf is at the moment. And for me the top sporting experience of the year was not any of England’s many and deserved cricketing triumphs, good though they were, but the four days my wife and I spent at Royal St George’s watching the Open Championship. This was sport at its peak both in respect of the quality of the golf played over the four days and the wonderful end game in which Darren Clarke was triumphant. Tiger Woods apart all of the world’s top golfers were at Sandwich and is was a delight to see some living legends of the game, like Tom Watson, as well as the impressive and precociously young rising stars like Rickie Fowler and the British amateur Tom Lewis. Oddly the British players who have risen to the top of the world rankings, Donald, Westwood and McIlroy and those close by – Rose, Poulter and Casey all had a poor Championship. But that was swiftly forgotten as we celebrated Clarke’s triumph. Golf crowds in my experience are generous in their applause and well-behaved (I’ve never been to a tournament in the United States) and that was certainly the case at The Open. To this the players responded and there were a few moments which would grace any sport – Tom Watson’s smile at the end of the second round not because of his play (good though it was) nor because of his hole in one at the sixth but because his playing partner, 20 year old Tom Lewis, had followed his opening 65 with a solid 74 to make the cut. The “Tiger effect” on golf has been good, bad and ugly. Good because it undoubtedly raised the profile of the game. Bad because it detracted somewhat from Tiger’s contemporaries as so much of the media attention was on Woods. And ugly because it eventually emerged that the Emperor had no clothes (or no trousers anyway) and that beneath the commercially burnished exterior there was a disturbed, dysfunctional and struggling human being. Well behaved though they generally are pro golfers are not saints and from time to time they set a pretty bad example. The American team in the Ryder Cup has a simplistic chauvinism about it that is stomach churning to the more urbane European eye. When they had a pre-tournament pep talk from an Army major last year it inspired Phil Mickleson to comment “I feel proud to be part of a country that cares about the civil rights of people all throughout the world and not just in our own country,” Hmm! The top golfers are multi-millionaires and used to a lifestyle that is beyond the imaginings of most of us. I have no problem with this because below that top tier are hundreds hoping to make it and not living in the lap of luxury whilst they do so. Ian Poulter recently tweeted when someone criticised his poor performance in a tournament “You think I'm going to lie here feeling sorry having worked in a pro shop for 7 years earning $200 a week. Enjoy what you work hard for.” A nice piece of honesty from Poults – and few would disagree with his sentiment. Poulter is the archetypical Ryder Cup competitor – fiercely proud and a great team man. Woods never really delivered in the Cup what his talent should have given – and the contrast between the striving for individual glory of Tiger and the authentic team focus of Poulter and the rest of his European colleagues has been marked. Golf is such an individual game that it takes something special to blend rivals together but with Britain and/or Europe holding the Ryder, Walker, and Solheim Cups (and GB and Ireland the Seve Trophy) we must be doing something right this side of the Atlantic! Long may it continue – and let’s hope that Donald, Westwood , Casey, Rose and our other very good British pros can find a way to follow Clarke’s triumph ( and those of McIlroy and McDowell) and bag themselves a Major or two soon. There has been plenty of highly charged and emotional stuff around since Lancashire’s victory in the County Championship. From me included! And this nostalgia, when you come down to it, is a big part of what is wrong with domestic Cricket in England. Its strengths – the sort of honest but blind devotion we see in this blog for example – are also its weaknesses. The irony will have escaped some but at a time when the England team is at its strongest point for years the County system is on its knees. It is ironic, but it is not paradoxical. The England set up has little if any connection with County cricket – its centrally contracted players rarely appear for their counties and County cricket is largely an irrelevance for England. “Hang on”, the cricket traditionalist will cry, “where do the international players come from if they don’t come from the counties?” Well one answer would be “Ireland, South Africa and now New Zealand” but that might be a bit too clever-clever and pat. Of course the England squad have all come from County cricket - where the heck else would they come from – it’s the only game in town! But that doesn’t make it the best game or even the right game – except to those who close their minds to change. The stark reality is that virtually all of the 18 counties are bankrupt or close to insolvency. They are only kept alive at all by hand-outs of around £2m each from the ECB. And where does the ECB get its money from to distribute this largesse? Well you and me actually. Three big sources of ECB funding are the Sky contract, international match ticket sales and the bids that major County ground owners make to have the right to stage a Test match or a limited overs international. Let’s just run through the implications for the cricket fan of these three ECB income streams. The Sky contract is exclusive – there is no live cricket on non-subscription television in Britain. None! So a cricket fan who wants to watch England’s Test match triumphs live will have to fork out a minimum of £50 a month across the year to see it on Sky. Our summer sport, unlike to an extent our winter ones (at least the international part of them) , is unprotected from the commercial priorities of Sky – this is regressive of course. The rich man in his castle pays the same to watch Sky television as the poor man at his gate. So if the poor man’s ten-year-old takes an interest in cricket he can’t just switch on the BBC or ITV or Channel 4 – he has to persuade his hard-pressed parents to cough up £50+ a month. Not very likely is it? Then there is the price of international cricket tickets to consider - they are by far the highest in the world. You can watch five days Test cricket in Australia for the cost of one day at Lord’s or The Oval. And you could watch a couple of seasons for that same amount in India. Why so high? Because the ECB says so - and the ECB says so because it needs the loot for the Counties. A day at a Test match for a family of four this year would have cost around £350 for the tickets alone. Oddly enough I didn’t see many families of four at the grounds this summer. What about the auction that the ECB runs for the right to stage international matches? Sealed tenders mean that for most of the games the keen applicants have to take a hard expensive punt to stand a chance. This has nearly bankrupted Glamorgan – to such an extent that they had to withdraw from staging a West Indies Test at Cardiff next year despite being awarded it. They couldn’t afford to pay for the privilege! And the MCC, owners of Lord’s, were forced into a trading loss last year by the blind bids they made to host Test matches. Its complete nonsense of course – most of all when you realise that the ECB only does it to gather money for the failing Counties! So Glamorgan bids high to stage a Test which generates income for the ECB who pass it back to the Counties – including Glamorgan. D'oh! So we pay of the order of £36m per year to keep the counties afloat. But, as this blog correctly says, nobody goes to watch them play - in the County Championship anyway. That we follow it in other ways may be true but that is hardly the basis of a sustainable business! And whilst the final round of Championship matches was certainly exciting through most of the season most of the cricket watching public hadn’t a clue about what was going on. The competition even stopped for a month or so so that the more money-spinning limited overs competitions could take place. Conservatives argue that outmoded businesses that blunder on sustained only by public hand-outs and with out-of - date business models should be allowed to die. That is precisely what we have in our current County system. There is direct public money – via the Sports Council – and indirect via Sky or the ECB’s inflated ticket prices going to County cricket. It may not all appear on Mr Osborne’s public sector accounts – but it’s as much public money as the NHS or the welfare state. I have argued that the solution for English domestic cricket is to have far fewer top tier domestic teams – about eight seems right - and far better competition. This need not be the end of the Counties (please follow the link to see my argument for an alternative County model). As with so much in life this is a battle between the modernisers who see the realities and the traditionalists who really do think that all is well. Act soon – or those past “Glories” will turn to dust! My father was born in Stockport a few days before the battle of the Somme in 1916. The town may be technically in Cheshire but then, as now, many of its inhabitants saw themselves as Lancastrians – my father certainly did - not least in his lifelong support for Lancashire County Cricket Club. Like me Dad became a cricket fan at a very early age and by the time he was ten a Lancashire allegiance was engrained in him. Good timing, for in 1926 Lancashire won their first County Championship for 22 years and followed this with further wins in 1927, 1928, 1930 and 1934. A golden age indeed for the red rose County but thereafter, a solitary tied Championship in 1950 aside, no wins at all – until now. Back in the 1920s one of the lynchpins of the Lancashire side was the Australian Test match fast bowler Ted McDonald. From 1925 to 1930 he was virtually an ever present in the side taking 970 wickets in 193 matches – an average of five per game. McDonald has a firm place in the Briggs family folklore because in 1930 he was photographed giving his autograph to a couple of young Lancashire fans – one of whom (the boy on the left in the cap) was my father. Not only did he sign Dad’s autograph book but he undertook later to get all of his team-mates autographs as well – on the cardboard frame in which the photo was placed. The original of that framed photograph is in the excellent cricket museum at Old Trafford. Ted McDonald was unusual in playing in County cricket as an overseas player in the inter-war years he had to qualify and for two years he played in the Lancashire League before making his county debut in 1924. This followed a very successful tour with the 1921 Australians when he took 27 Test wickets at an average of under 25. It is intriguing to observe that he was already 33 years old when he made his first appearance for Lancashire and that his in final full season, 1930, he was 39. Not bad for someone described in Wisden as being “…far faster than the average English fast bowler”! My father would have been thrilled with Lancashire’s success in the Championship this year. I only watched his County with him once but that was in the famous 1971 Gillette Cup final against my own County Kent. I was born in Kent and it was never even a subject for discussion that I chose to support the County of my birth rather than adopt my father’s team. We sat together for that enthralling match at Lord’s when Kent looked to be on the way to overhauling Lancashire’s modest 60 Over total of 224 until Jackie Bond took a famous catch to dismiss the on-fire Asif Iqbal. 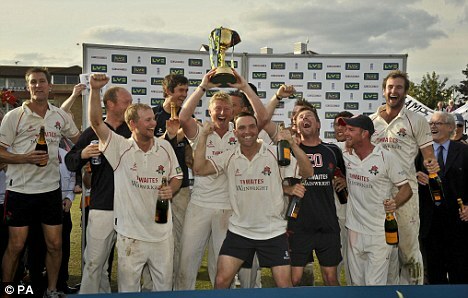 Lancashire has an astonishing record in One Day cricket with no less than 16 trophies between 1970 and 1998 – though none since. But for all this, in my father’s view, the only domestic cricket prize that really mattered was the County Championship and I am sure that if Dad was around today his smile would have been as wide as it was at Lord’s in 1971 – and he would be reminiscing about the games he saw the last time Lancashire stood unchallenged at the top of the pile way back in 1934.